Escape the craziness of Las Vegas! Today’s post has been written by Corey, courtesy of Anna Nowak of Postcards from the World. Never stop exploring is Anna’s motto. She writes about some of the most spellbinding and spectacular places on the globe. 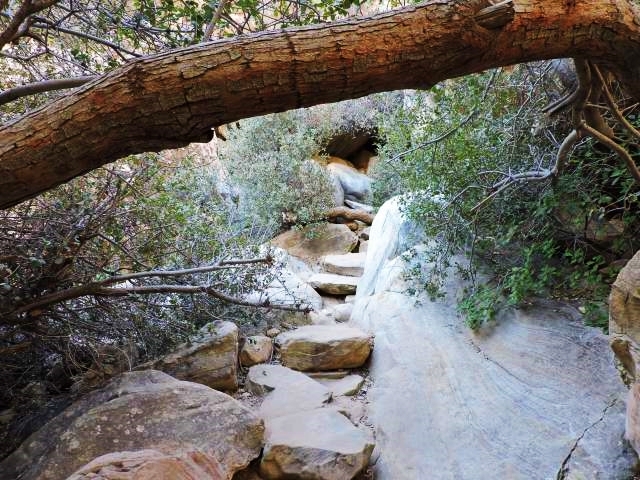 Hiking in Red Rock Canyon, just beyond the outskirts of the bustling Las Vegas strip, is the focus of this guest post. 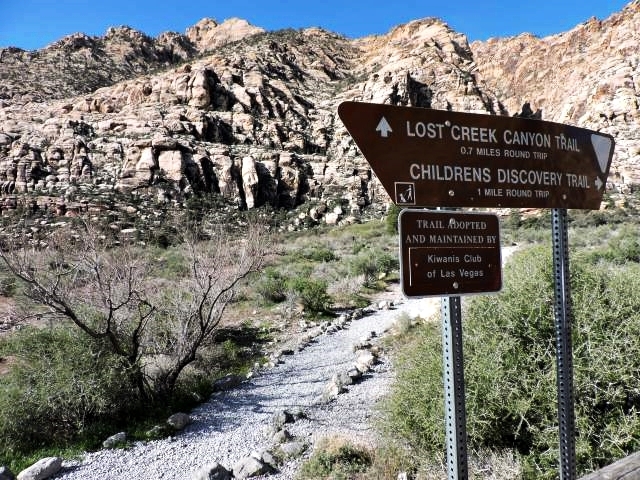 If you are looking for a relaxing getaway to escape the craziness of Las Vegas, hiking in Red Rock Canyon is a great alternative. It is located approximately 15 miles west of the Las Vegas Strip via State Route 159 and is protected by the Bureau of Land Management as a National Conservation Area. The Conservation Area has a one-way loop that allows visitors to enjoy a 13-mile scenic drive, or park at designated areas that provide access to nearly twenty hiking trails. I encourage you to stop at the visitors center at the start of the loop. It’s a fantastic way to learn more about the history and biology of Red Rock Canyon. They also have experts that can provide additional information about the various trails and activities to make your trip more enjoyable. I’ve hiked all over Arizona and I’ve seen the same trails over-and-over. I focus on getting my workout in and I don’t pay attention to the scenery any more. However, I kept stopping to take it all in at Red Rock Canyon. I stopped to take pictures. I stopped to read the innovative interpretive exhibits. Sometimes I stopped just to shake my head because I couldn’t believe how beautiful everything was. It was 360-degrees of jaw-dropping, postcard-worthy views. Millions of people visit Red Rock Canyon every year so it tends to get busy on the weekends. However, I visited on a Wednesday morning which was only moderately busy and because they have so many trails it felt like I had the entire place to myself! I did the Lost Creek Canyon trail hoping the waterfall would be active. Then, I could tell everybody I saw a waterfall in the middle of the desert and they would think I’m crazy! The waterfall is typically active from January to March but it varies depending on the weather and rainfall. See also: Hiking in The Subway. I ran into one lovely couple that helped me navigate the trail which was great because the path wasn’t always clearly marked. In fact, I have a few words of caution for this specific trail. 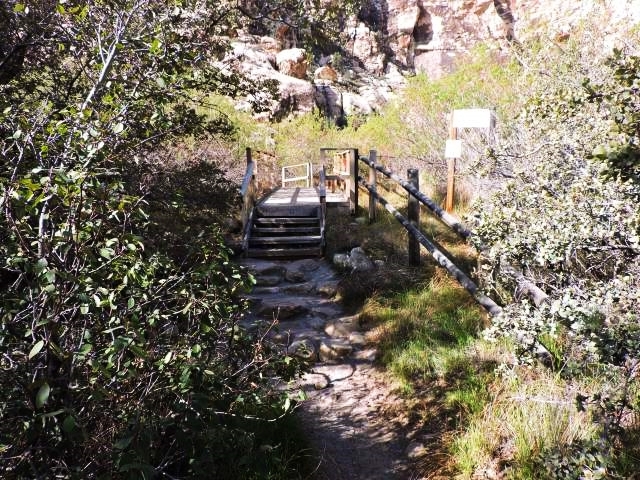 Even though this is the shortest trail (~⅔ mile round trip) at Red Rock Canyon – it isn’t necessarily the easiest. I would not recommend doing this hike solo. The elevation gain (~300 feet) isn’t really an issue, but the terrain is uneven with many large obstacles that require crouching or climbing over. Also, the path isn’t always clearly marked as mentioned above. I went the wrong way and had to backtrack on several occasions. The hike took around 75 minutes and that included stopping to take pictures, getting lost and making new friends (I think they were worried about me). Red Rock Wash is the first major reference point you will reach. In wet years there may be water present but it was very dry during my trip. Look for flagstones that guide you out of the wash up to a stone staircase. They can be difficult to see if you aren’t paying attention, so make sure you don’t get turned around like I did. After the stone stairs you will approach a boardwalk that was built to allow the vegetation around the area to regrow after so much foot traffic. There is a creek beneath the boardwalk when weather permits. See also: Love hiking? Try Havasupai Falls. A large Ponderosa Pine marks the halfway point of the hike. Another stone staircase takes you to the rabbit-hole tunnel where a massive boulder hangs over the path. It’s a tight squeeze so watch your footing and use caution. The last stretch before the end of the hike was a path that had a several trees and vegetation as obstacles. Make sure to duck! See also: Guest post- best hikes and trails. I could hear the waterfall flowing before I could see it, which built up the anticipation and made it more exciting when I made it through the last leg of climbing before reaching the clearing. It wasn’t gushing like Niagara Falls but I still felt fortunate that I could witness it. Las Vegas has countless man-made waterfalls like the one outside the Mirage Hotel, but there is something majestic when you experience it in a natural setting. There is a ton of places to relax and watch the waterfall and enjoy a snack or drink. It would also be a great spot to escape from the sun underneath the shade from one of the large trees near the base of the waterfall. Overall, it was a cool little hike you could easily complete it in less than an hour if you are pressed for time. It also gives you ample time to enjoy the scenic drive and visitors center. I will definitely go back my next visit and try one of the longer and more challenging trails. Corey and his wife are Las Vegas enthusiasts who visit Red Rock Canyon multiple times per year. If he’s not playing poker, he can probably be found walking the Strip taking pictures. Corey started www.vegasinformant.com to share his travels and provide information to potential visitors. Are You Ready to Start Your Own Arizona Adventure? Take the stress out of traveling, planning, and exploring the Southwest. Join us for an Arizona experience you’ll treasure for a lifetime. Contact Southwest Discoveries today to speak directly with a tour guide. Ask questions, get details, and learn more about what awaits you on one of our tours of the Southwest.